9123 Welch, Spring & Co., Bristol, Conn. No. 2 Regulator. This is a large and impressive clock with an 18 inch dial. The case is veneered in rosewood and mahogany. It was refinished a number of years ago. The very bottom 2 inch molding piece has been professionally remade. The rosewood graining on the top circular portions has been removed and that should be redone to put the clock in original looking condition. It has the original painted dial but for some reason the section with the seconds dial has been overpainted. Both glasses are original along with the hands, weights, signed beat scale, black flocking on the backboard and heavy brass pendulum with a gilded rod. For a similar example see page 92 of Tran Duy Ly’s original Welch book. This is an eight-day double weight timepiece. I have not tried running the clock. I would prefer not to attempt to ship this large and fragile clock so we should try to work out some sort of a pickup or delivery. 55 inches tall with an 18 inch time-track dial. $925. 9124 Seth Thomas Umbria wall clock. This clock has a refinished case of solid quartersawn oak and oak veneer. The case is in good, clean condition. There is a thin 2 ½ inch section that was skillfully repaired on the very left edge of the central molding. It may show up as a slightly lighter spot in the photo. The signed dial is in good condition with only a few very small paint flakes. It comes with the original hands, key, brass beat scale and upper glass. The lower glass and the wooden pendulum rod are replacements. This is an eight-day spring driven clock with hourly strike on a gong and it is running. 9126 Rare Kroeber “Round Head” wall clock. 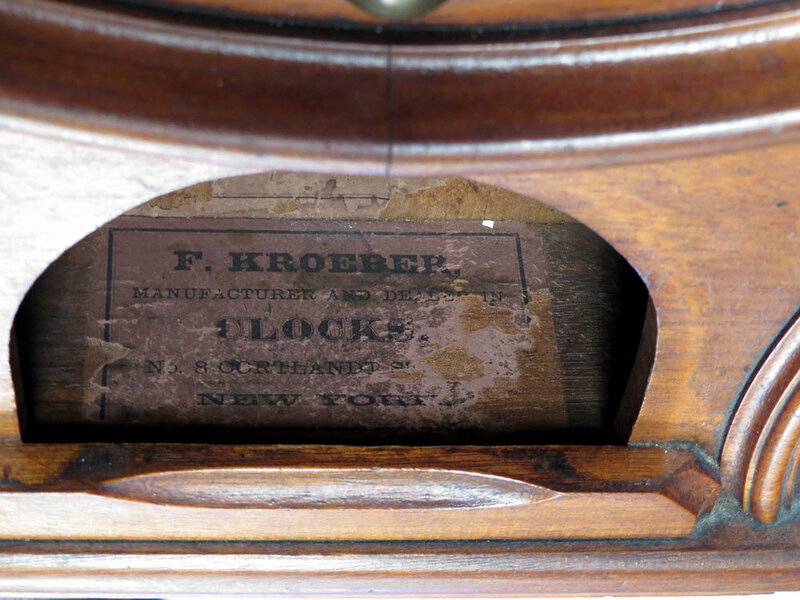 In the Kroeber book this clock is shown as the 1878 model and it is a very nice clock by a notable maker. Wall clocks by Kroeber are not at all common and this one is in excellent, original condition. It has a very clean solid walnut case in the original finish without any case problems or damages. There are six applied half sphere brass trim pieces around the upper portion. The lower arched panel lifts out to access the pendulum. Inside that area you will find two good labels. It has the original painted dial that has numerous, but quite small, paint flakes. It retains the original glass, hands, pendulum and brass key. This is an eight-day timepiece and it is in good running order. 9127 E. N. Welch Eclipse Regulator calendar clock. This clock has a solid oak case which has been very nicely refinished and is perfect, without any chips or other defects. This is one of the better models with the pressed stars decorating the upper and lower portions. It has the original Eclipse Regulator stenciled glass and the fancy sunburst style brass pendulum. The pendulum is clean and bright, without any oxidation. The dial paper and calendar hand are replacements while the Welch style hour and minute hands are original. It has a dark but legible label on the back. This is an eight-day timepiece plus calendar and it seems to be in running order. 9128 New Haven Branford short drop school clock. This clock has a very clean refinished solid oak case with pressed designs. I do not see any damages, chips or repairs to the case. It has the original upper glass and regulator lower glass. The dial paper is a modern replacement. That dial indicates that this is a calendar clock and there indeed is a calendar mechanism on the movement but I do not believe it is original. I think this is a standard time and strike movement and someone added calendar gearing to improve it. That gearing does not function well so I would not count on the calendar portion to perform as it should. The minute and hour hands along with the pendulum are original, while the calendar hand is a replacement. This is an eight-day clock with hourly strike on a gong. It is running but the strike train needs repair. 27 inches tall with a 12 inch dial. $125. 9129 Ingraham Dew Drop calendar wall clock. This clock has a clean, refinished rosewood case. The rosewood grain painting on the upper and lower doors is still fairly strong. Note that there are a couple of shrinkage cracks at the joints in the upper door and the glass in that door is cracked. The lower door has the original reverse decorated glass. The dial paper is the original but you can see that it has yellowed a bit. The pendulum, hour hand and minute hand are original but the calendar hand is a replacement. This is an eight-day timepiece (no strike) and it is running. 24 inches tall with a 12 inch dial. $125. 9130 Dew Drop calendar wall clock by Ingraham. This clock has a rosewood case with rosewood graining on the doors and that graining is still in pretty good condition though it certainly could use some cleaning. The original dial paper has darkened considerably. It has the original hands, pendulum, glasses and a fair label. It is missing the calendar hand and the calendar gear to which it attaches. The other two parts of the calendar gearing are there. This is an eight-day clock with hourly strike on a gong. The movement has not been cleaned in quite some time and that will need to be done to put the clock in good running order. 24 inches tall with a 12 inch dial. $85. 9131 Gilbert 10 Inch Octagon Drop wall clock. This clock has a rosewood case under a very dark finish. I believe there are several veneer repairs under that dark finish. It has the original glasses and the lower door has a gilded frame around that glass. It has the original dial paper which does show some yellowing. It comes with the original hands, pendulum and a good label on the back. This is an eight-day clock with hourly strike on a gong. The movement has not been cleaned in many years and that will definitely need to be done before the clock will be in running order. 23 inches tall with a 10 inch dial. $95. 6070 French picture frame clock. This clock has a black painted wood frame door with a glass over an interior frame done in gold leaf. Behind that is another panel of glass which is reverse painted with the dial and a scene with rabbits, a fox etc. There is some paint flaking in the sky area but the rest is fine. The clock has the original hands. I do not know if the pinecone weights are original to this clock or if it should have a different style. I did not get a pendulum with the clock. Without a pendulum I am not able to run the clock but I have run the strike train and I am sure this is a 30 hour movement. This style of clock has the movement in a wood framed box with brass gearing. Often this model has a great deal of veneer problems but this one is much better than average. The case is mahogany with a thumbnail sized piece of veneer missing on the upper corner of the left side and a smaller one on the point at the bottom. It has a clean original finish and nothing needs to be done other than to hang it on your wall. Below the dial is an ivory plaque and whatever was printed on it has long worn away. The dial paper is signed and in very good condition with just a very minimal amount of discoloration. It has the original hands, pendulum, Regulator A glass and a good label. This is an eight day clock with hourly strike on a gong. The movement probably has not been serviced for a while but it is currently running and striking properly. 8064 Gilbert oak wall clock. This clock has a clean, refinished solid oak case without any damages or problems but note that the door glass is missing. It has the original dial paper which does show some spotting. The hands are original while the pendulum is an old replacement. This is an 8 day timepiece. It runs a short while for me then stops. 17 inches tall with a 12 inch dial. $85.